From the first cut of brass to the soldering and sanding to the final polish, the long and intricate process of creating a piece of jewelry is creative, expressive, and fulfilling. We teamed up with a Javanese entrepreneur named Ignatius who specializes in 3D drawings and jewelry design. He believes in fair, ethical business. “I believe when you are willing to pay more for products, you’ll get good quality products. 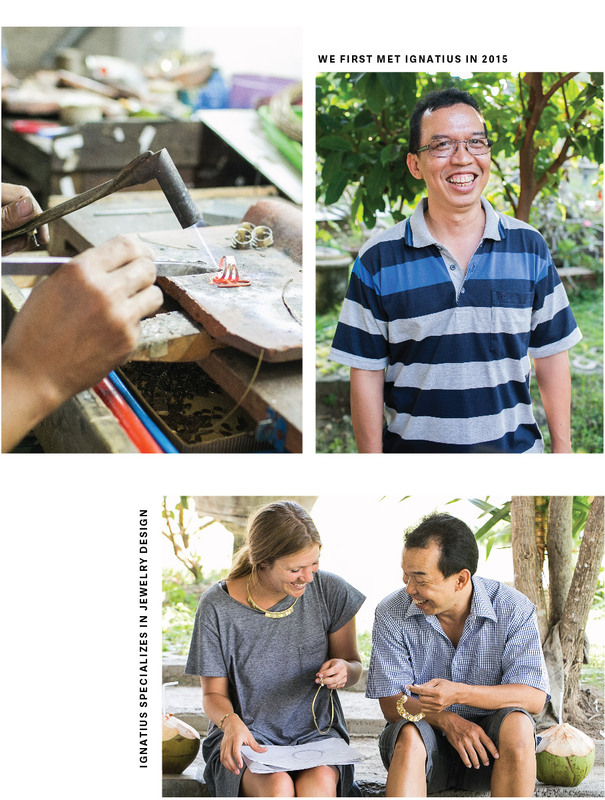 You’ll be able to hire artisans who are skilled and you’ll be able to bring in people with good attitudes about their work.” Ignatius gives dignified work opportunities to Javanese artisans who would otherwise be working in poorly run sweatshops. He pays his artisans more than double what they were making at any other jewelry manufacturer. By partnering with Ignatius, he has been able to triple the amount of artisans in his workshop. A few of the original men we worked with include Fauji, Mahfud, Emam, and Kus. They’ve spent years studying and perfecting the craft of making jewelry from brass. Each of them spent countless years working in factories where the work was inconsistent and they were paid poorly. By partnering with Ignatius, they are able to work full-time, allowing them to provide for their families, send their kids to school, and put money into savings. For these skilled artisans, it’s not just about making money, it’s about doing something they love. From the first cut of brass to the soldering and sanding to the final polish, the long and intricate process of creating a piece of jewelry is creative, expressive, and fulfilling.